14 Years And One Memoir Later, A Gitmo Detainee Awaits His Fate Mohamedou Ould Slahi, one of the best-known prisoners, may be close to release. The U.S. prison in Cuba is down to 80 prisoners, but it's unlikely President Obama will meet his promise to close it. 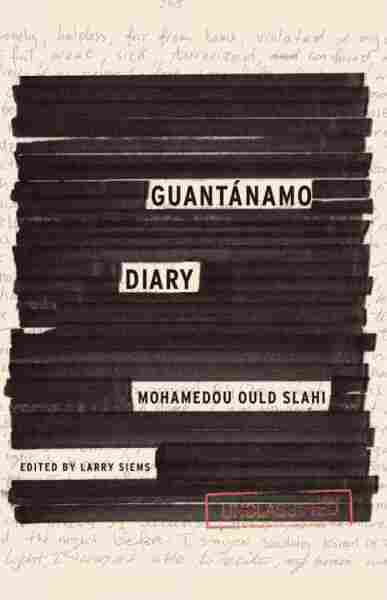 Few Guantanamo Bay prisoners are better known than Mohamedou Ould Slahi. That's because Slahi hand-wrote a 466-page memoir in 2005 about his prison ordeal which finally got published last year, albeit with sections blacked out by government censors. Guantanamo Diary is a detailed account of the treatment Slahi received under his American captors, including, he says, extensive torture. Now a government panel is deciding whether Slahi's detention in Guantanamo, where he's been since August 2002, is still justified. If it is not, he would become eligible for transfer to his native Mauritania or any other country willing and eligible to receive him. The status-review hearing Slahi got on June 2 by video conference with six government agency members on the Pentagon's Periodic Review Board, or PRB, was a long-sought victory for his defense team. Last year, Slahi's lawyers had tried unsuccessfully to get a federal judge to order such a hearing. The last time Slahi's detention was reviewed by his jailers had been a decade earlier. A 2010 order for his release by U.S. District Court Judge James Robertson was appealed by the Justice Department and sent back to a lower court. It may take a month to learn the PRB's decision about Slahi's fate. A brief profile read at the opening of the hearing of MR-760, as the government refers to Slahi, does not charge the 45-year-old engineer with any crimes. It does repeat earlier allegations that Slahi swore allegiance to al-Qaida, without noting he's believed to have done so in the early 1990s in Afghanistan at a time when that group was, like the U.S., opposed to Kabul's communist regime. He's also portrayed in the profile as having "established a broad network of terrorist contacts while living in Germany, Canada and Mauritania." While conceding most of those contacts have been detained or killed, the government asserts that "MR-760's relation to Abu Hafs al-Mauritani — a former al-Qa'ida leader currently residing in Mauritania — could provide him with an avenue to re-engage, should he decide to do so." Still, there are clear indications in the government's profile of Slahi that he is no longer considered, as he once was, Guantanamo's most dangerous inmate. "MR-760 has maintained his support for jihad," the document notes, "but clarifies that his notion of jihad neither condones the killing of innocent people nor supports Bin Ladin's 'version of justice.'" If repatriated to Mauritania, it adds, Slahi "probably would reunite with his family, take care of his sisters, and start a business," and, if permitted, "travel internationally to promote his book." Wearing a white T-shirt in a windowless room in Guantanamo and sitting at the end of a table, Slahi said nothing during the brief unclassified portion of the hearing — the only part of the live-streamed session that reporters were allowed to view in a secure room at the Pentagon. Two unidentified members of the military, both wearing camouflage fatigues, were at the table as Slahi's "personal representatives." One read a statement calling Slahi "one of the most compliant detainees with the detention staff," whose conduct "has continuously been exceptional." He said they were "certain that Mohamedou's intentions after Guantanamo are genuine, that he possesses sound judgment, and that he is good for his word." Although Slahi has never acknowledged any criminal behavior, the uniformed personal representatives also sought to portray him as contrite — a move that human rights advocates who follow the PRB hearings say increases the likelihood of a favorable ruling by the board. "Mohamedou understands his past mistakes," said one personal representative. "He believes what al-Qaida has done is wrong and wants nothing to do with the organization or its members." Slahi's private counsel, Theresa Duncan, was also at the table. "Mohamedou does not present any threat to the United States," she said in a prepared statement, "nor has he ever taken any hostile action against our country." Duncan submitted a letter to the review panel from one of Slahi's former guards, who she said wrote that he "would be pleased to welcome" Slahi into his home if the Mauritanian is released. The rest of the hearing was seen and heard only by the participants, including any questions the PRB members may have had for Slahi and his representatives. As with all PRB hearings, there was nobody independent of the U.S. government involved in the evaluation of the need for Slahi's continued detention, nor will there be a chance to appeal a negative ruling. After nearly 14 years' imprisonment with no formal charges against him and no trial, the task for Slahi — like the hundreds of other Guantanamo detainees who've already been transferred — was to convince his captors he no longer poses the threat they attributed to him without any due process. At Guantanamo, the burden of disproving what amounts to an official presumption of guilt lies on the accused. For President Obama, whose promise to close the Guantanamo prison has been stymied by Congress, the PRB process has become his most successful means for shrinking the island prison's population. The PRB has noticeably picked up the pace of its hearings over the past six months — reviewing 30 cases in the first six months of 2016, five times as many as during the same period last year. The goal is to have every one of the remaining 80 inmates in Guantanamo screened by the PRB by the end of July. Twenty-nine of those prisoners who remain at Guantanamo have already been deemed eligible for release. Most are from war-torn Yemen, so by U.S. law third countries will have to be persuaded to receive them. Three inmates have been convicted by military commissions and seven others are in pre-trial hearings. And then there are the "forever prisoners" — the 30 or so who the U.S. is unable to try for lack of admissible evidence, but who are deemed too dangerous to release. Obama would like to transfer these "forever prisoners" and those facing trial to detention facilities in the U.S. But Congress is once again blocking any such transfers. The fate of Guantanamo's lock-up will likely be in the hands of the next U.S. president. Hillary Clinton and Bernie Sanders have said they want it closed. Donald Trump not only wants to keep it open — he's said he would add to its population by sending captured Islamic State fighters to the cells on Cuba's southeast coast.